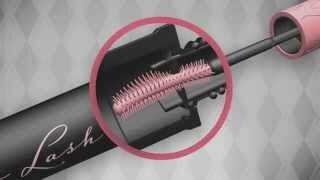 It's a roller for lashes! The eye-opening Hook ‘n' Roll™ brush grabs, separates, lifts and curls…while the instant curve-setting formula holds for 12 hours. Contains provitamin B5 and serin, ingredients known for their lash-conditioning benefits. Available in two stunning shades, original ink black or brown. Keep the party going: add a coat of they’re real! mascara.